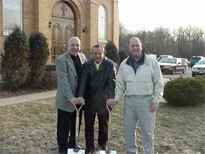 On Wednesday April 4th, St. Luke held the ground breaking ceremony for the new bell tower and educational complex. 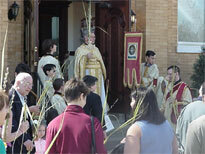 Bishop Job of the Dioceses of the Midwest officiated along with Fr. Andrew Harrison, our rector, and Fr. Nicholas Jonas of SS. 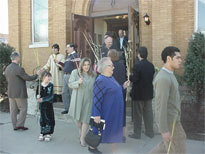 Constantine & Helen Parish. 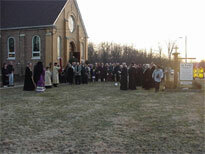 Other clergy attending were Fr. 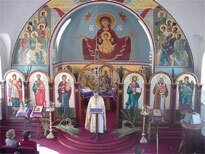 Raphael Biernacki, Fr. Oleg Mironowic, Fr. 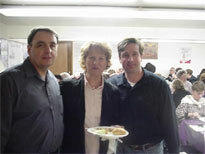 Alexis Fedec, Deacons Andrew Werbiansky, and Danial Doss. Mr. Peter Coulos, our real estate attorney and Mr. Nick Batistich and his son our architects and Mr. Matt Englebrake from Security Church Finance, the bond issuing company, also attended. 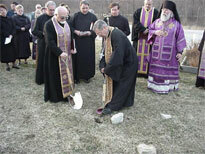 Bishop Job performed the traditional bell tower ground breaking ceremony by reading the blessing and placing three rocks to commemorate the Trinity on the spot where the bell tower is to be erected. 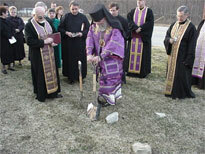 After this Bishop Job and Father Andrew circled and sprinkled the land where the educational complex will be constructed. 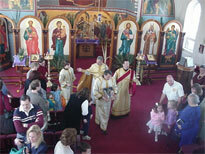 After the blessing all processed into the church for the Presanctified Liturgy. 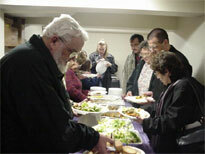 After the Liturgy and evening Lenten dinner was provided for parishioners and guests. At this rate we could dig the foundation ourselves. 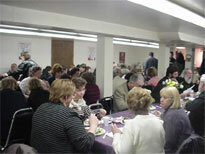 The lenten dinner in the basement was enjoyed by all.